Jo Shin is an artist and graduate student at the School of Interactive Arts + Technology at Simon Fraser University, where she is a member of the criticalmediartstudio (cMAS), supervised by Dr. Gabriela Aceves Sepúlveda. Jo’s work focuses on digital technology as a medium for archiving, remembering and creating social memory of everyday life. Her current project is a design research ethnography that explores the ways members of housing collectives in the Vancouver Lower Mainland define community. 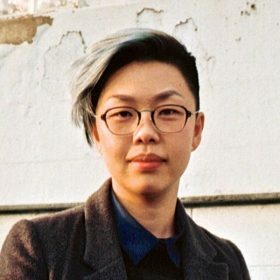 Jo Shin has a professional background as a digital strategist in the arts non-profit sector, having worked with PuSh International Performing Arts Festival, Vancouver Queer Film Festival, Sydney Film Festival, and TD Vancouver International Jazz Festival. She’s currently a user researcher at a tech startup. Jo is an active community member currently serving on the boards of Megaphone Magazine and Hope in Shadows.